If you’ve not seen the Razer’s first foray into the handset world, head over to YouTube and do some looking. Most major tech vloggers have covered this slightly-unconventional phone from just about every angle. Overall, it is a device that lives in extremes: huge battery, crazy-smooth 120Hz refresh on the screen (most phones are 60Hz), stereo front-firing, independently amplified speakers, and 8GB of RAM. Coupled with the squared, angular build, this phone won’t be mistaken for anything else anytime soon. In addition to these superlatives, Razer has gone and done something no one else has tried just yet. It is called Project Linda. The concept itself has been done before, just not the execution. We’ve seen phone-as-processor computing setups before, but nothing quite as beautiful and thoughtful as what Razer has done. And it is all pretty simple, too. Drop the phone into the dock where the trackpad should be and your phone now becomes the laptop’s internals. The only thing in the laptop is a screen, keyboard, chassis, ports, and batteries. The phone simply steps in as the motherboard. Razer made an awesome design choice in the way the phone plugs in as well with a retracting USB-C plug that slides into place at the touch of a button. It is crazy-cool to see and really locks the phone into place with a satisfying amount of force. On the software side, the phone is simply set to launch Sentio, an Android app that mimics a desktop. You can download and run the app right now if you wish and get a good idea of what the desktop experience will be like on Project Linda. For now, the software was really buggy and problematic, but that isn’t really the point just yet. 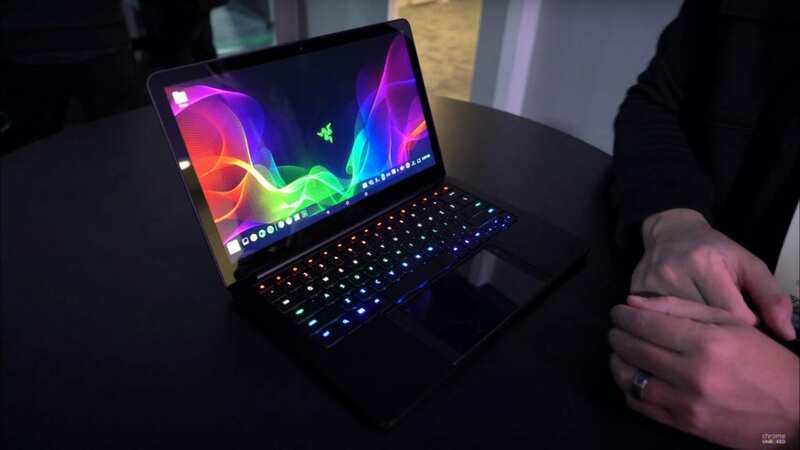 Razer simply wanted to show off what it is working on from a hardware perspective. We’ve talked before about the possibility of Chrome OS on a phone in one way or another. We’ve talked about a phone running just Chrome OS and simply running a phone luancher when not docked. We’ve talked about the possibility of simply dual-booting both Android and Chrome OS on one device. All these discussions came rushing back the minute I laid eyes on Project Linda. Imagine, just for a second, a phone that had Android and Chrome OS both installed in a dual-booting setup. Think about how quickly something like the Pixel 2 can reboot. It takes about 10 seconds. Think about how quickly the Pixelbook can reboot. It’s about the same. Then consider a device that could have them run side by side like a Chromebook can do with Crouton and Ubuntu. All this in addition to the transfer speed of USB-C and you have the recipe for a device that could run Android when in phone mode and boot up Chrome OS the moment it is docked. Even from a cold boot, Chrome OS is up and running just as fast as we saw the Sentio app start up on the Razer phone in the video. Then, imagine how much more productive you could be on Chrome OS when docked versus a desktop-like app on a phone. I’ve used it and it isn’t great. I also use Chrome OS daily and it is very, very productive. It would be the best of both worlds in a singular device. We know that there is a Chrome OS device in the works with the newest Qualcomm Snapdragon 845, so we’ll soon see what Chrome OS does on top-tier ARM-based silicon. Needless to say, I have pretty high hopes. It may not be this year, but I would be surprised if we didn’t see something like this in the next couple years. My hope is Google would try it with the Pixel line as that would just make sense. Throw in the desktop dock and I’d be all in, honestly. Perhaps the real-world application wouldn’t be as great as I imagine, but it certainly is something I’d like to give a try. Imagining this Pixelbook hardware with my Pixel 2 XL tucked in as my trackpad just seems so enticing. What about you? Does the idea of a single device, docked wherever I go have appeal for you? Let us know in the comments!